There are several interesting dimensions to the first major political event in Iraq after the Eid: The resignation from the Iraqi government of Muhammad Tawfiq Allawi, the minister of communications. Firstly, of course, there is the party politics of the case. The presence of Allawi inside the cabinet at a time when his cousin and party chief Ayad Allawi remained very much on the sidelines of government sent an ambiguous message about how the Wifaq group within the Iraqiyya coalition related to the premiership of Prime Minister Nuri al-Maliki. One possible consequence of the resignation is that it may have a liberating effect on Wifaq and can help turn it into a more purely oppositional party. From the margins, Wifaq may be freer to speak its mind and criticize a government where it is now much less involved. 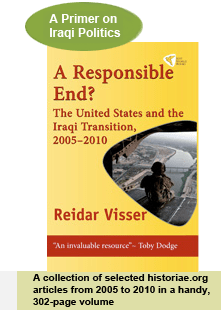 The flipside to that, of course, is that the move might solidify cracks in the Iraqiyya coalition that have become more evident over the past few months as Maliki successfully has lured at least parts of the Sunnis and secularists in Iraqiyya to take a more cooperative stance (as seen most recently in the return of Salih al-Mutlak to cabinet as vice premier). The letter from Allawi was not really a resignation letter but an ultimatum letter. It ended with a simple request for Maliki to remove Yasiri, or else. As is now well known, Maliki didn’t do anything to unseat Yasiri and Allawi eventually resigned. The case of Hiyam al-Yasiri is interesting as an example of female empowerment in post-2003 Iraq. The debate rages as to whether the Iraq War represented a setback or a step forward for Iraq’s women. On the one hand, Iraq had one of the best educated female workforces of any Middle Eastern countries prior to the war, with some women even playing infamous roles in the regime’s weapons programmes. Many saw the triumph of Islamism after 2003 as a step backward for the secular vision of female empowerment in public life. On the other hand though, post-2003 Iraq has seen some interesting new mechanisms for female empowerment that were introduced in part thanks to external (US and UN) pressure, including most notably female quotas in parliament that secure a higher rate of female MPs in Iraq than in many Western countries. Some say the women in the Iraqi parliament owe their positions more to family ties than to championship of women’s issues. Others have stood out for positions that shocked many Western feminists, including outspoken criticism of lesbians and declarations in favour of eradicating homosexuality in Iraq. Whichever way they should be interpreted, newly empowered women like Hiyam al-Yasiri clearly stand up for their ideas. And Yasiri is not alone. 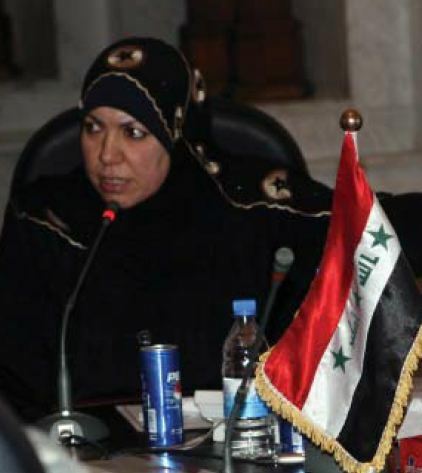 Take other famous cases like Basima Luay al-Jadiri (who rose to an important position in a key security-related office of PM Maliki) and Lubna Rahim (recently in conflict with Iraqiyya members in Babel for having allegedly threatened them with armed guards). Their values and goals may be very different from what feminists in other parts of the world advocated when Iraq was rebuilt after 2003. But they form an important contrast to the more marginal role played by their sisters in both Iran and Saudi Arabia. And, as the resignation case of Allawi shows, they refuse to be pushed around. At a time when most Iraqi politicians seem to consider the cabinet crisis to be over, attention is increasingly turning to the next local elections, scheduled for early 2013. More and more, it is being suggested that major political reform may well end up on the back burner again, with a decision on the electoral commission composition perhaps the most prominent issue of the day (it is also on the agenda as parliament meets today). Yesterday finally saw a vote on revisions to the provincial electoral law that originally dates back to 2008. Symptomatically, perhaps, the revisions have yet to be published on the parliament website! But at least some features are known from press reports. The problem with the revised law is that the Iraqi supreme court has already deemed it unconstitutional, at least if press reports about the contents are true. This is so because the revised law reportedly keeps the principle of allotting surplus seats to winning parties only, using the largest remainder principle. In 2010, the supreme court, based on a request from the small communist party, specifically ruled this arrangement “undemocratic” (and therefore unconstitutional), and demanded change to a more proportional allocation formula. Apparently, this aspect – which after all was one of the main reasons there was a need to change the law in the first place – was conveniently forgotten by Iraqi politicians yesterday. In other words, once more Iraq is saddled with a law that will be unconstitutional from the get-go. Other reported changes concern the allotment of additional minority seats for Fayli Kurds and Turkmens (the latter reportedly in Baghdad). Again, this may be indicative of a trend in Iraqi politics. The previous iteration of the law only gave true micro-minorities (Yazidis, Christians, Shabak etc.) seats in particular governorates, whereas medium-sized minorities like the Turkmens and the Fayli Kurds were left with the option of mobilizing within the framework of the ideologically defined (non-ethnic) parties. Inevitably, one gets the impression that the more Iraqis are encouraged to vote in closed ethnic constituencies, the smaller the prospect for the development of a truly national political fabric. With recent moves to expand the size of the electoral commission, it is conceivable that this trend will only continue to grow further. Meanwhile, one interesting aspect of the decision yesterday on electoral law changes is the political dynamic. It was reportedly a deal between the two biggest coalitions, Iraqiyya and State of Law, that led to agreement. These two groups will both benefit from maintaining the current, largest-remainder for winning blocs principle regarding the “surplus” seats. For their part, Shiite parties outside Prime Minister Maliki’s bloc like Fadila and the Sadrists have already been prominent in criticizing yesterday’s parliament decision. A major elephant in the room, of course, was the disputed city of Kirkuk, which never held elections in 2009, and where the issue of ethnic quota seats remains a big problem. This is an ironic reminder, then, about how State of Law and Iraqiyya could have got things done in parliament if their leaders could just hate each other a little less. Symptomatically, perhaps, when the two finally did vote together in parliament, it was on an issue that is likely to maximize their own powers in the crudest sense imaginable, at the expense of the smaller forces in Iraqi politics.